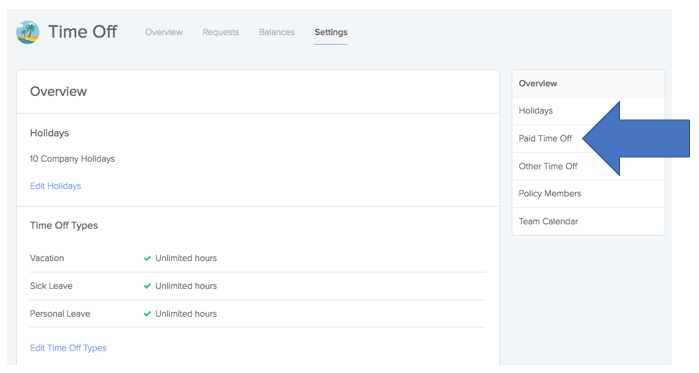 On December 20, 2017, we released an upgrade to Time Off tracking on GoCo! You can read more about all the changes here, but one of the biggest improvements is that you can now track accruals. 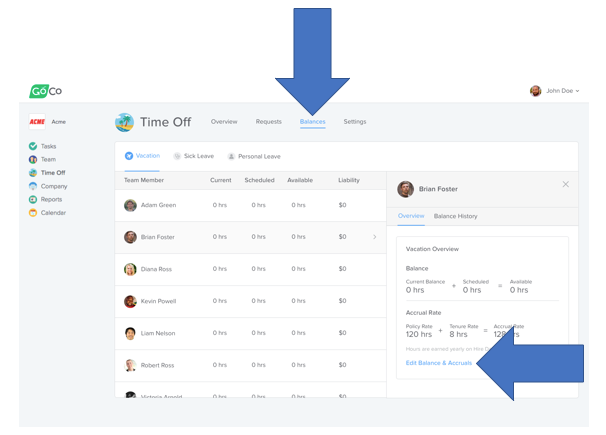 Below is a quick setup guide to setup the new Time Off feature (including PTO accruals) for your company. From the Company page, click on the Manage button on the Time Off card. 5. Enable / disable each time off type and then click Edit to setup the accrual rules. You can learn more about each individual accrual setting here. In case you're wondering, you can read more about why the defaults are all set to unlimited here. 7. Finally, you might also need to import your team's current accrued time off balances. To do that: (1) click on Balances from the top navigation, (2) click an employee, (3) click on Edit Balances & Accruals. Note that all changes take effect immediately!